British ranking agency Quacquarelli Symonds (QS) has ranked 23 Pakistani universities among the top 500 Asian universities for 2019, up from 16 in 2018. Other South Asian universities figuring in the QS top universities report are 75 from India, 6 from Bangladesh and 4 from Sri Lanka. In terms of the number of universities ranking in Asia's top 500, Pakistan with its 23 universities ranks second in South Asia and 7th among 17 Asian nations topped by China with 112, Japan 89, India 75, South Korea 57, Taiwan 36, Malaysia 26, Pakistan 23, Indonesia 22, Thailand 19, Philippines 8, Hong Kong 7, Vietnam 7, Bangladesh 6, Sri Lanka 4, Singapore 3, Macao 2 and Brunei 2. National University of Singapore ranked number one in Asia followed by University of Hong Kong and Nanyang Technological University in Singapore. Tsinghua University and Peking University—both from China—round off the top five list in Asia. 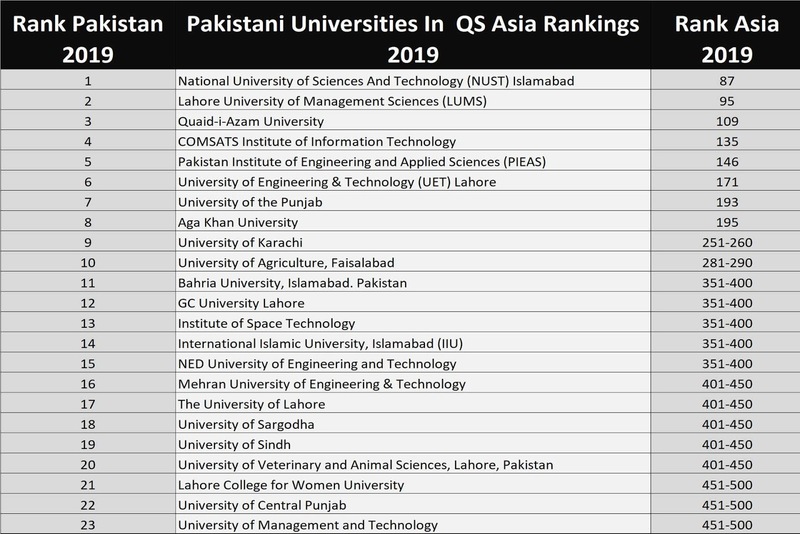 National University of Sciences and Technology (NUST) is the top ranked university in Pakistan in QS Asia University Rankings 2019. NUST has moved up from 91st to 87th position. The second ranked university in Pakistan is Lahore University of Management Sciences (LUMS) at 95th position in the Asian ranking. 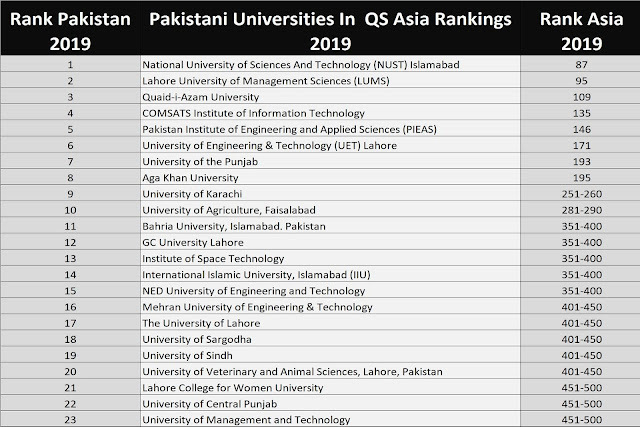 These are the only two Pakistani universities ranked among the top 100 in the QS Asia University Rankings 2019. By contrast, India has 8 universities ranked among Asia's top 100. My alma mater NED University of Engineering and Technology is ranked 15th among Pakistan's 23 universities included in Asia's top 500 for 2019. 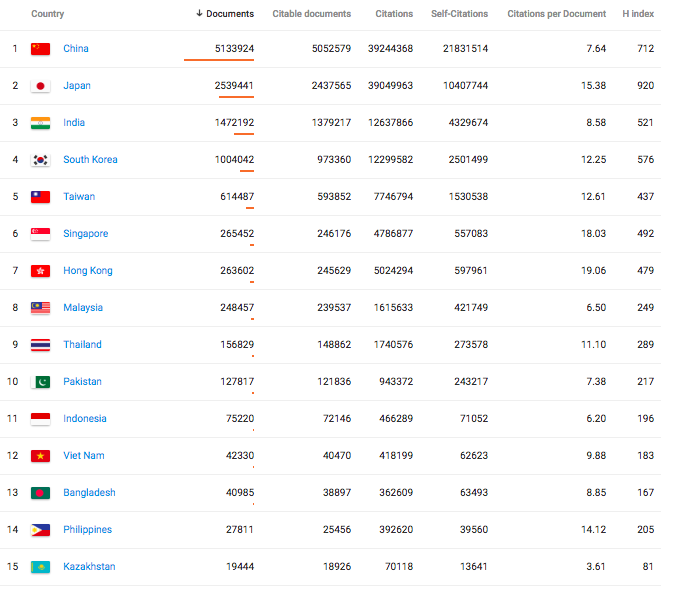 Pakistan has emerged as the country with the highest percentage of Highly Cited Papers compared with the BRIC countries (Brazil, Russia, India and China) in the last 10 years, according to Thomson Reuters. Pakistan has doe so despite the fact that its "R&D environment faced substantial economic challenges". In a report titled "Pakistan: Another BRIC in the Wall", author Lulian Herciu says that Pakistan’s scientific productivity has quadrupled, from approximately 2,000 articles per year in 2006 to more than 9,000 articles in 2015. During this time, the number of Highly Cited Papers featuring Pakistan-based authors increased tenfold, from 9 articles in 2006 to 98 in 2015. The author asserts that his report provides comparisons between Pakistan and BRIC nations taking a look at productivity and leveraging contextual indicators. His analysis points to the fact that Pakistan can be benchmarked with emerging and dynamic countries such as those in the BRIC (Brazil, Russia, India and China) group. 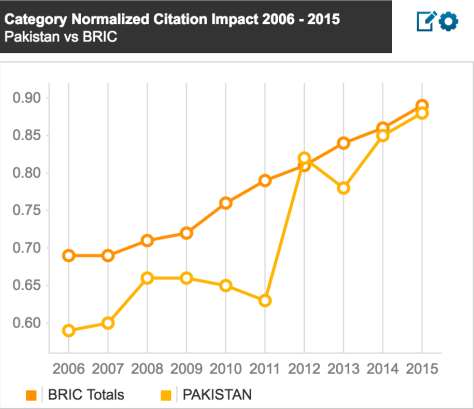 The Thomson Reuters report has found that, in 2012, "Pakistan's normalized Citation Impact was higher than that of all of the BRIC nations". In 2014, Pakistan became the first Asian country and only the third in the world after Turkey and Serbia to be honored with CERN's associate membership. The status of associate member is a step before full membership. As an associate member, Pakistan is entitled to attend open and restricted sessions of the organization. There are over 3 million students enrolled in grades 13 through 16 in Pakistan's 1,086 degree colleges and 161 universities, according to Pakistan Higher Education Commission report for 2013-14. The 3 million enrollment is 15% of the 20 million Pakistanis in the eligible age group of 18-24 years. In addition, there are over 255,000 Pakistanis enrolled in vocational training schools, according to Technical Education and Vocational Training Authority (TEVTA). Pakistani universities have been producing over half a million graduates, including over 10,000 IT graduates, every year since 2010, according to HEC data. 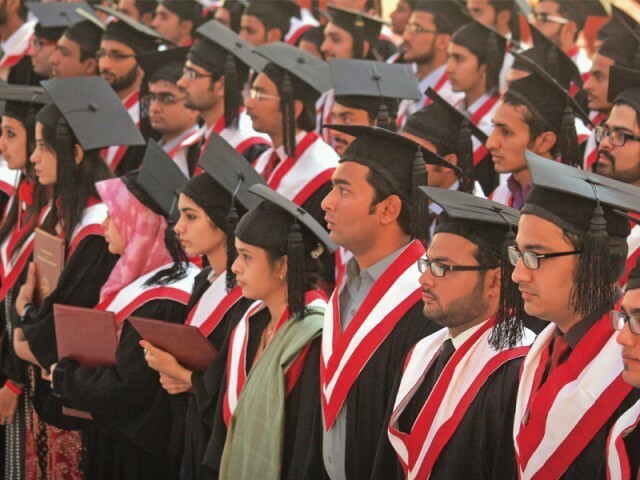 The number of university graduates in Pakistan increased from 380,773 in 2005-6 to 493,993 in 2008-09. This figure is growing with rising enrollment and contributing to Pakistan's growing human capital. Higher education in Pakistan has come a long way since its independence in 1947 when there was only one university, the University of Punjab. By 1997, the number of universities had risen to 35, of which 3 were federally administered and 22 were under the provincial governments, with a combined enrollment of 71,819 students. A big spending boost by President Pervez Musharraf helped establish 51 new universities and awarding institutions during 2002-2008. This helped triple university enrollment from 135,000 in 2003 to about 400,000 in 2008, according to Dr. Ata ur Rehman who led the charge for expanding higher education during Musharraf years. There are 161 universities with 1.5 million students enrolled in Pakistan as of 2014. Rise of research and publications at Pakistani universities began during Musharraf years when the annual budget for higher education increased from only Rs 500 million in 2000 to Rs 28 billion in 2008, to lay the foundations of the development of a strong knowledge economy, according to former education minister Dr. Ata ur Rehman. Student enrollment in universities increased from 270,000 to 900,000 and the number of universities and degree awarding institutions increased from 57 in 2000 to 137 by 2008. Government R&D spending jumped seven-fold as percentage of GDP from 0.1% of GDP in 1999 to 0.7% of GDP in 2007. It has since declined as percentage of GDP. 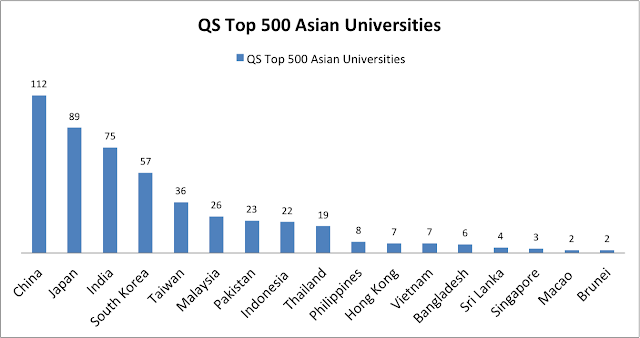 British ranking agency Quacquarelli Symonds (QS) has ranked 23 Pakistani universities among the top 500 Asian universities for 2019, up from 16 in 2018. Other South Asian universities figuring in the QS top universities report are 75 from India, 6 from Bangladesh and 4 from Sri Lanka. Pakistani scientists and researchers are continuing to produced highly cited research in spite of serious economic and security challenges. 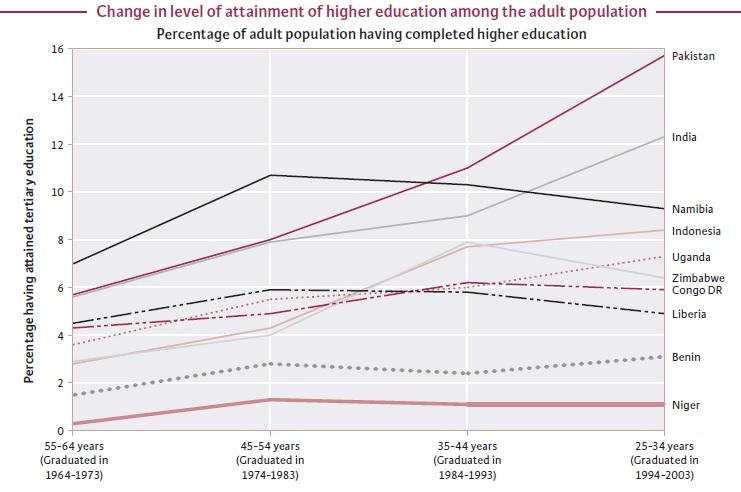 Enrollment in higher education is rising and giving a boost to academic research. With better policy focus and more investment in higher education, Pakistan can make an even greater impact with its young demographics. Thanks Riaz bhai for this data. World has moved on since 2009 and more recent education attainment data is available till 2017 on UNESCO website. Number of technical and scientific papers published in journals by Pakistan increased from 1,420 in 2003 to 9,180 in 2016. "Number of technical and scientific papers published in journals by Pakistan increased from 1,420 in 2003 to 9,180 in 2016. How does that compare to Brazil (roughly same size) or India (neighbour)? Nisar: "How does that compare to Brazil (roughly same size) or India (neighbour)?" Brazil has 22 universities in top 500 compared to Pakistan's 23. But why go half way around the world to Brazil for comparison? Why not compare in Asia with Indonesia which has a bigger population but fewer universities (22) than Pakistan (23) in top 500? There is a proposal to translate and publish all Pakistani publications into Chinese language simultaneously along with English. Sister universities in China will make the effort and this could lead to a swell in citations shortly. Pakistan is expected to be in Asia Top 5 in next 5 years as per my sources. Pakistan ranks 40 among 161 countries for quality adjusted scientific output for year 2017 as reported by Nature Index 2018. Pakistan ranks 40 with quality-adjusted scientific output of 37.28. India ranks 11 with 935. Malaysia ranks 61 with 6.73 and Indonesia ranks 63 with 6.41. Bangladesh ranks 100 with 0.81. Sri Lanka ranks 84 with 1.36. 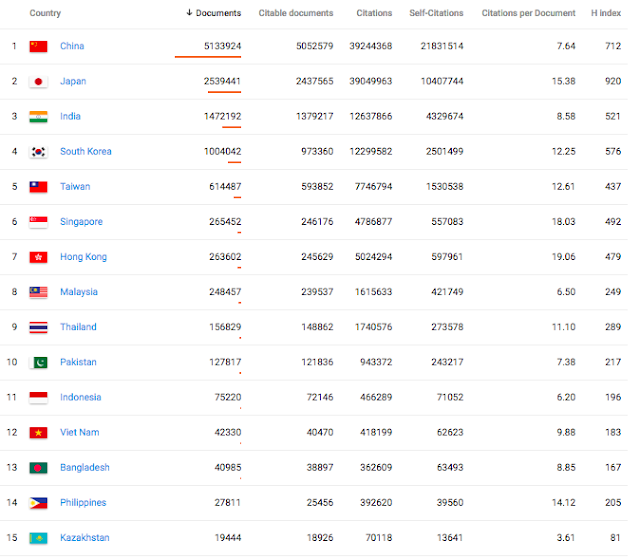 US leads with almost 15,800, followed by China's 7,500, Germany 3,800, UK 3,100 and Japan 2,700. The Nature Index is a database of author affiliation information collated from research articles published in an independently selected group of 82 high-quality science journals. The database is compiled by Nature Research. The Nature Index provides a close to real-time proxy of high-quality research output and collaboration at the institutional, national and regional level. Pakistan's quality-adjusted scientific output (WFC) as reported in Nature Index has doubled from 18.03 in 2013 to 37.28 in 2017. Pakistan's global ranking has improved from 53 in 2013 to 40 in 2017. In the same period, India's WFC has increased from 850.97 in 2013 to 935.44 in 2017. India's global ranking has improved from 13 in 2013 to 11 in 2017.